This article is about the town of Carrickfergus. For the song, see Carrickfergus (song). For the poem, see Carrickfergus (poem). For the barony, see Carrickfergus (barony). Carrickfergus (from Irish: Carraig Fhearghais, meaning "Fergus's rock") is a large town in County Antrim, Northern Ireland. It sits on the north shore of Belfast Lough, 11 miles (18 km) from Belfast. The town had a population of 27,903 at the 2011 Census. 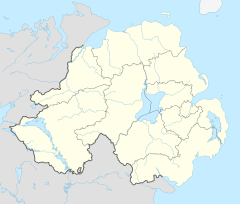 It is County Antrim's oldest town and one of the oldest towns in Ireland as a whole. Carrickfergus was the administrative centre for Carrickfergus Borough Council, before this was amalgamated into the Mid and East Antrim District Council in 2015, and forms part of the Belfast Metropolitan Area. It is also a townland of 65 acres, a civil parish and a barony. The town is the subject of the classic Irish folk song "Carrickfergus", a 19th-century translation of an Irish-language song (Do Bhí Bean Uasal) from Munster, which begins with the words, "I wish I was in Carrickfergus". The British peerage title of Baron Carrickfergus, which had become extinct in 1883, was bestowed upon Prince William on his wedding day in 2011. There are also other notable churches such as that of North Street Presbyterian Church which was one of the first Presbyterian churches to be established in Ireland. (Services on Sunday: 9:30 a.m., 11:00 a.m. and 6:30 p.m.). There are many other churches beyond these. The town is said to take its name from Fergus Mór (Fergus the Great), the legendary king of Dál Riata. According to one tale, his ship ran aground on a rock by the shore, which became known as "Carraig Fhearghais" – the rock of Fergus. As an urban settlement, Carrickfergus far pre-dates the capital city Belfast and was for a lengthy period both larger and more prominent than the nearby city. Belfast Lough itself was known as 'Carrickfergus Bay' well into the 17th century. Carrickfergus and the surrounding area was, for a time, treated as a separate county. The historical walled town originally occupied an area of around 97,000 square metres, which now comprises the town centre, bordered by Albert Road to the west, the Marine Highway to the south, Shaftesbury Park to the north and Joymount Presbyterian Church grounds to the east. Segments of the town wall are still visible in various parts of the town and in various states of preservation. Archaeological excavations close to the walls' foundations have yielded many artefacts that have helped historians piece together a picture of the lives of the 12th and 13th century inhabitants. Sometime between 1203 and 1205, De Courcy was expelled from Ulster by Hugh de Lacy, as authorised by King John. de Lacy oversaw the final construction of the castle, which included the gatehouse, drum towers and outer ward. It was at this time that he established the nearby St Nicholas' Church. de Lacy was relieved of his command of the town in 1210, when King John himself arrived and placed the castle under royal authority. de Lacy eventually regained his title of Earl of Ulster in 1227, however the castle and its walled town were captured several more times following his death (in 1242) and the town largely destroyed by the Scots in 1402. A drawing of Carrickfergus Castle circa 1840. In 1637 the Surveyor General of Customs issued a report compiled from accounts of customs due from each port and their "subsidiary creeks". Of the Ulster ports on the list, Carrickfergus was first, followed by Bangor, Donaghadee, and Strangford. In the same year the town sold its customs rights - which ran from Groomsport, County Down up to Larne, County Antrim to Belfast. This in part led to its decline in importance as the province of Ulster grew. A plaque at the harbour commemorates the landing of William of Orange in the town in 1690. Nevertheless, the decaying castle withstood several days of siege by the forces of William of Orange in 1689, before surrendering on 28 August. William himself subsequently landed at Carrickfergus on 14 June 1690. During the Seven Years' War, in February 1760, the whole town was briefly captured and held to ransom by French troops landed from Francois Thurot's naval squadron, after the defenders ran out of ammunition. In 1711 Carrickfergus was the scene of the last witchcraft trial in Ireland. Eight women were charged with bewitching a young girl, and were convicted, despite a strong indication from one of the judges that the jury should acquit. They were sentenced to a year in prison and four sessions in the pillory. In April 1778, during the American War of Independence, John Paul Jones, in command of the American ship Ranger, attempted to capture a British Royal Navy sloop of war, HMS Drake, moored at Carrickfergus. Having failed, he returned a few days later and challenged Drake to a fight out in the North Channel which the Americans won decisively. During World War II, Northern Ireland was an important military base for United States Naval and Air Operations and a training ground for American G.I.s. The First Battalions of the elite US Rangers were activated and based in Sunnylands Camp for their initial training. The US Rangers Centre in nearby Boneybefore pays homage to this period in history. It is rumoured that Italian and German POWs were held in the town, the Italians in a camp at Sullatober mill, and Germans at Sunnylands. In the 1970s, the town became an important centre for the textile industry. An ICI man-made fibres factory was opened at Kilroot and was followed by the Rothman's cigarette factory. Courtaulds operated a large rayon works there until the 1980s. In 1981, Kilroot power station opened and is the largest power station in Northern Ireland. Carrickfergus now is a centre for leisure sailing, and is home to Carrickfergus Marina and Carrickfergus Sailing Club. The town is part of the Greater Belfast conurbation, being 11 miles (18 km) from Belfast city centre. On 8 September 2007, Carrickfergus was the Northern Irish host for the Last Night at the Proms, featuring Alison Balsom, Alfie Boe, and Ulster conductor Kenneth Montgomery. Throughout the course of The Troubles, there was a reasonably large paramilitary presence in the town, namely the Ulster Volunteer Force and Ulster Defence Association. Census figures show that the Catholic population of Carrickfergus declined from 16.2% in 1971 to 9.56% in 2011. West Street on a quiet day. The marina complex in Carrickfergus. The war memorial at Joymount, in Carrick's town centre. The wall mural and replica pillory in the town centre are popular attractions for visiting tourists. 9.56% were from a Roman Catholic community background and 85.08% were from the Protestant or other Christian community backgrounds. William Orr, United Irishman was hanged in Carrickfergus on 14 October 1797 for his part in the failed rebellion. Jonathan Swift, the poet and satirist lived in Kilroot, on the outskirts of the town, and wrote A Tale of a Tub there. Charlotte Riddell, writer of the Victorian period, was born Charlotte Eliza Lawson Cowan (1832) in Carrickfergus. Bob Gilmore (1961-2015), musicologist and player of piano and keyboards, was born in nearby Larne; lived in Carrickfergus during his childhood. Seán Lester (1888–1959) was born in Carrickfergus. He was the last Secretary General of the League of Nations, from 1940-46. Louis MacNeice's family moved to the town when the poet was two years old (his father was appointed Rector of St Nicholas' Church of Ireland Church), and he left at the age of ten to attend boarding school in England; one of his poems, Carrickfergus (1937), relates his ambiguous feelings about the town where he spent his early boyhood. Sammy Curran, a prolific Irish League goalscorer between the wars playing for Woodburn and Belfast Celtic among others, who was also capped 4 times by Ireland. Billy McMillan, former Belfast Celtic and dual IFA and FAI Irish international footballer who lived his entire life in Carrickfergus. Patrick Joseph Kelly, member and leader of the IRA's East Tyrone Brigade, killed by the SAS in Loughgall, was born in Carrickfergus. Jackie Woodburne, actress (Neighbours), was born in Carrickfergus. Adrian McKinty, novelist, was born and raised in Carrickfergus. Kristina Grimes, runner up in the final of the third series of the British version of The Apprentice once lived in the town. Stuart Robinson, host of Northern Ireland's Young Star Search and presenter on Cool FM. Dave Finlay, former WWE wrestler, was born and raised in the satellite village of Greenisland. Ryan Eagleson, Derbyshire and Irish international cricketer, 65 caps for Ireland, 1995-2004. Niamh Kavanagh, Irish Eurovision entrant and winner of 1993. Jimmy Hill (Norwich City) and Billy McCullough (Arsenal), Northern Ireland international footballers born in Carrickfergus. Willie Irvine (Burnley) and Bobby Irvine (Stoke City), Northern Ireland international footballers who were born in nearby Eden before moving to Carrickfergus. Carrickfergus railway station opened on 1 October 1862. In addition, the northwest of the town is served by Clipperstown railway station, and the east by Downshire railway station. All three stations have regular commuter services to Belfast and Larne. Three historic stations in Carrickfergus, Barn, Eden and Mount, closed in the 1970s. Translink also operates a local 'town-service' bus route and regular services to both Whitehead and Belfast. United Bus company (https://www.unitedbuscompany.com/), Northern Irelands oldest bus company that dates back to the late 1800s was started in Carrickfergus and has now grown to be the third largest bus and coach company across the entirety of Ireland. Carrickfergus is covered by the East Antrim constituency, whose MP is Sammy Wilson of the DUP. The Parliamentary constituency of Carrickfergus existed from 1801-85. ^ The Online Scots Dictionary; retrieved 21 August 2012. ^ "Carrickfergus". IreAtlas Townlands Database. Retrieved 20 April 2015. ^ a b c Mediæval Times in Carrickfergus' History Archived 5 March 2011 at the Wayback Machine, carrickfergus.org; accessed 2 May 2016. ^ Maxwell, David (2014-03-12). "History unearthed at medieval castle". BBC News. Retrieved 2018-02-19. ^ O'Neill, B (ed). (2002). Irish Castles and Historic Houses. London, UK: Caxton Editions. p. 14. ^ 1500s and Beyond in Carrickfergus Archived 5 March 2011 at the Wayback Machine, carrickfergus.org; accessed 8 March 2016. ^ O'Sullivan, Aidan; Breen, Colin (2007). Maritime Ireland. An Archaeology of Coastal Communities. Stroud, UK: Tempus. p. 212. ISBN 978-0-7524-2509-2. ^ a b Recent Times Archived 5 March 2011 at the Wayback Machine, Carrickfergus.org; accessed 2 May 2016. ^ "Carrickfergus History | The Complete History of Carrick | Part 2 | Carrickfergus History". Carrickfergus History. Retrieved 2018-02-19. ^ Census data, cain.ulst.ac.uk; accessed 24 September 2015. ^ NI Statistics and Research Agency website. ^ "Carrickfergus" (PDF). Railscot - Irish Railways. Retrieved 27 August 2007. ^ "Carrickfergus strengthens links with America". 5 August 2009. Archived from the original on 27 February 2012. Retrieved 24 September 2015. ^ Fessel, Lynn (9 May 2006). "Jackson City Council Meeting: Minutes, 9 May 2006" Archived 21 November 2007 at the Wayback Machine, City of Jackson, Michigan website; accessed 24 September 2015. ^ Portsmouth-Carrickfergus agreement, 20 May 1994. Archived 8 March 2016 at the Wayback Machine. Wikimedia Commons has media related to Carrickfergus. Wikisource has the text of the 1911 Encyclopædia Britannica article Carrickfergus. Wikivoyage has a travel guide for Carrickfergus.